One of the loneliest places to be during the holidays is in a roomful of people when you’re not feeling the gaiety. It’s okay to acknowledge how you feel and to seek guilt-free solitude. It’s also okay to reach out for help. You are not alone. There are many people who struggle with feelings of loneliness during the holidays. The challenges of daily life are real even in the midst of the most joyous time of the year. If you’ve experienced a recent loss of a loved one, job or are having serious health-related problems these things can impact how you feel. Try to remember this is one moment in time and though difficult it may be, you will pull through. 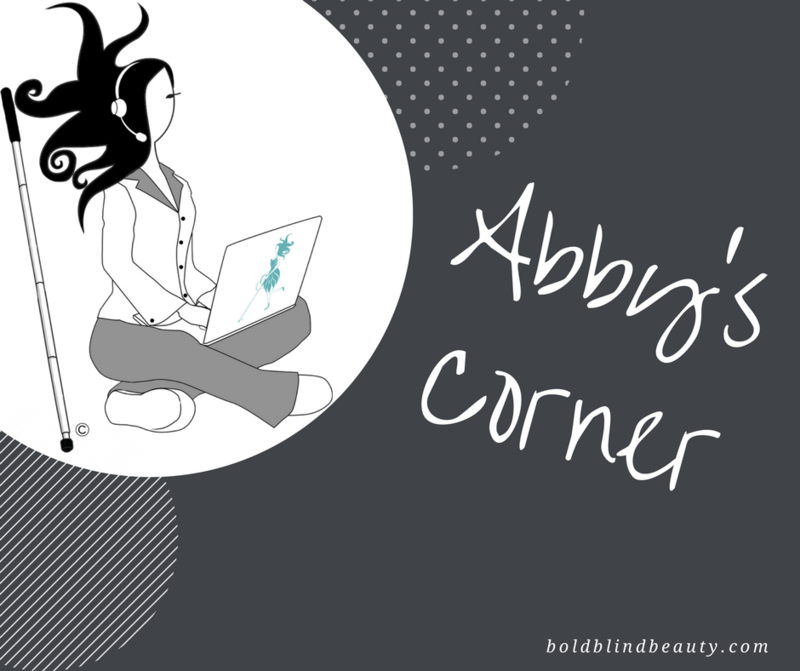 Description: A white, teal, and gray boldblindbeauty.com template utilizing the ‘Abby’s Corner’ image of Abby sitting cross-legged in her PJs (gray bottoms & white top with a gray collar) with a teal Abby logo laptop on her lap. Behind Abby to her right is a teal colored Christmas tree with a gold star and ornaments. She is sporting her signature explosive hairstyle while wearing a headset with microphone and her white cane is propped up next to her. In the background are light gray snowflakes. Who doesn’t like to feel and look glamorous? 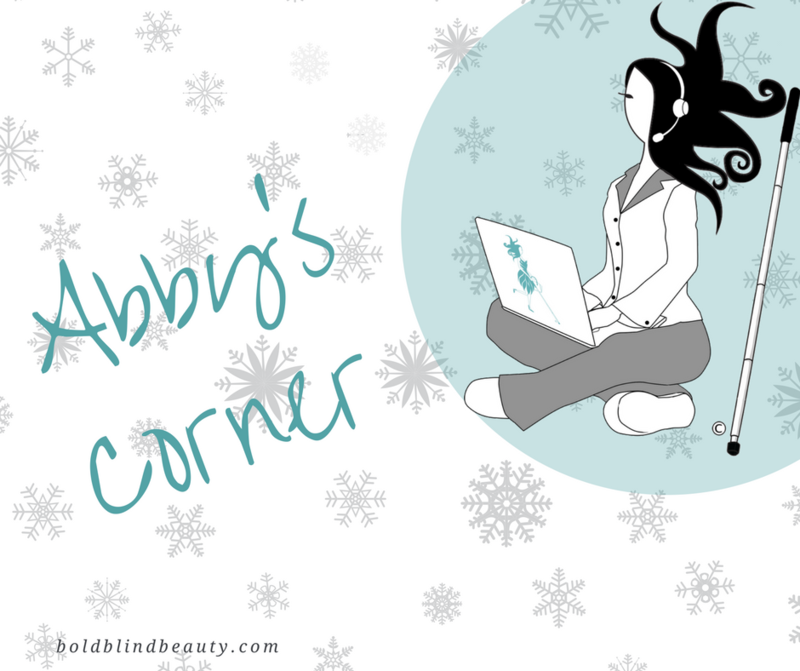 As we’ve touched on many times here at Bold Blind Beauty, even us blind ladies care about our appearance and for us, the holidays are no exception. Right now is the perfect opportunity to channel your inner diva and you can do it in a subtle yet stunning way with a skirt and sweater combo. There is so much we can do to mix colors, textures, and pieces to create a sophisticated look guaranteed to make you feel like a million bucks. For today’s look, I took a luxurious holiday red velvety soft sweater and paired it with a body-hugging black midi skirt adorned with large buttons down the left side. If metallic apparel isn’t your thing you can get your sparkle on with a pair of silver pointy toe pumps and finish off with a silver faux fur jacket. A red mini tote bag, black onyx stud earrings, oversized shades and faux leather driving gloves round out this outfit. All that’s needed now is a red lip, festive manicure and you’re good to go. Holiday gatherings can be a little unsettling when you aren’t aware of your surroundings and when you use a white cane it can get a tad dicey navigating a room full of people while balancing food, drinks, and handbag. I opt for a bag with a shoulder strap so I can wear it cross-body to free up a hand in addition to going sighted guide especially in dense group settings. Holiday/winter collage with white/silver snowflakes and three white/silver slim unadorned trees each in a dark wooden base. Clothing and accessories are on top of this festive background. How do you like to get dolled up for the holidays? While you may not be able to see the forest for the trees, you can be a vision in an ensemble with multiple textures. In my second installment on engaging the senses through holiday fashion I’ve taken three knit separates added faux fur, velvet, reptile texture, and gemstones to create an overall glamorous vibe. When we view the world through the narrow lens of the majority we can miss out on brilliant nuances. The beauty in being able to see can hinder our ability to fully engage with our environment. Being born without or losing a sense like sight exposes us to a whole new world of sensory experience. The environment which the majority of us can see with our eyes is viewed very differently from a person who is blind or visually impaired. Take today’s outfit for example, looking at it with physical sight we can take in the bold black and white houndstooth pattern. The sparkle of the gemstones would catch our eye but how about the shape, cut, edges, and smooth facets on the crystals? From the perspective of blindness or visual impairment imagine how delightful the feeling is of running the fingertips through the fur on the vest or how this texture differs in comparison with the knit top. Taking in the smooth, bumpy surface on the handbag provides us with an added sensory experience by hearing the jingle of the adjustable shoulder chain or the magnetic closure. Then we have the soft, luxurious feeling of velvet ankle boots against the warm and cozy opaque tights. Yes, there is no denying that seeing with our physical eyes is awesome but even when we cannot see we can still, and in some cases even more so appreciate the beauty surrounding us. The difference is in our perception. Black rib knit sweater with gem embellished neck – funnel neck and long sleeves. Black and white houndstooth skirt – wrap-effect front, patch pockets, black trims. Shaggy vest in jet-black crimped faux fur – three-quarter length. Black velvet heeled booties – chunky heels. Silver-colored shoulder bag – silver chain strap. Here’s a little something to think about: Many people view blindness as a loss but there is another perspective seldom considered, the minority’s view.